A desperate city overrun by crime. A corrupt government whose control is slipping. Streets rampant with dangerous criminals, deadly assassins, and random street bombings. If it sounds like a city that needs the help of a certain masked vigilante, you’d be right. But in lieu of nocturnal caped heroes, a mysterious agency known only as “the Agency” has taken it upon itself to beat back the wave of crime and re-take the streets. You and the other players will take on the role of agents, competing against each other to fight crime the most efficiently and earn a promotion. But watch out… some of you may be undercover Androids sent by the government, poised to begin wreaking havoc across the city. This is the world of Rogue Agent. Convoluted backstories aside, in Rogue Agent you will take on the role of an Agent fighting crime in Rain City. In order to win, you’ll need to arrest and turn in criminals, take out assassins, disarm bombs, search for evidence, upgrade your equipment, and set up a network of informants. After 6 rounds of play, points are totaled and whoever has the most, wins. Each round consists of 3 phases – the Time phase, in which new threats are added to the city, the Action phase in which players can attempt to fight those threats, and the City phase in which threats move around, bombs count down, and assassins attempt to kill as much as possible. In the Time phase, the first player draws a few random tokens from a bag. 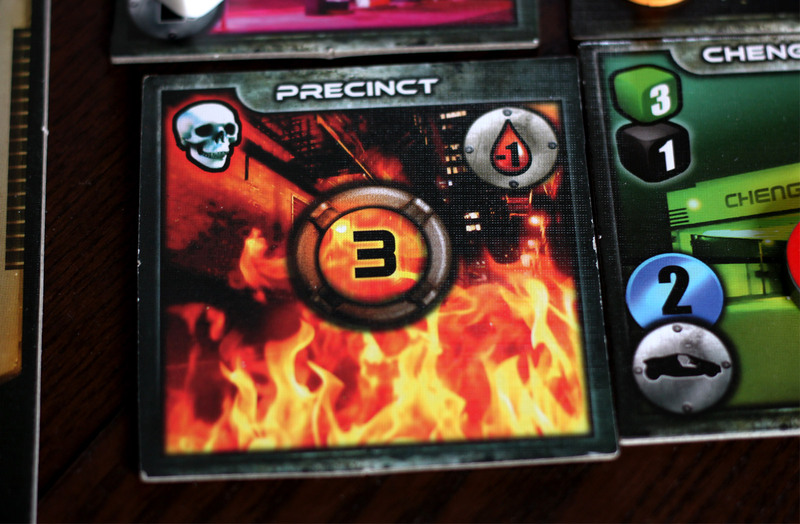 Then they roll dice to determine where in the city those tokens are placed, and if any bombs have been placed, another die is rolled to represent the countdown timer of that bomb. For each criminal token, a card is drawn from the Criminal deck and placed facedown with a matching token on it. In the Action phase, players take turns completing a series of actions. Cruising, or moving round the city, is limited only by the fuel you have. Investigating criminals allows you to look at a facedown criminal card, but you’ll need evidence. Then there are a series of actions called “Justice” actions, only 2 of which can be performed each turn. These actions include the ability to attack/subdue criminals (by rolling dice), arrest a subdued criminal (in order to move that criminal around with you to turn him/her in), intercept a criminal (take a criminal from another player so YOU can turn it in), Turn in a criminal in order to score the cash reward and collect the criminal card, Search locations (find equipment and upgrades by rolling dice indicated on the location), buy commodities (spend money for specific equipment and upgrades listed on a location), and finally disarm bombs (which involves rolling a series of dice and placing them on a grid in a specific order). Then, at the end of a turn, a player can pay to place one Informant in their current location. In the City phase, criminals and assassins move along a predetermined path that takes them around the entire city. Criminals move and activate assassins and bombs (in addition to their normal activations). Then Assassins attempt to assassinate Agents and Informants in their current location and the next 2 locations. The Police force then moves to a new precinct and arrest assassins and disarm bombs. Finally, bomb timers count down one step and may explode. The police actually protect you from thugs, but they also prevent you from actually fighting crime wherever they are. They’ll also take down assassins and disarm bombs. 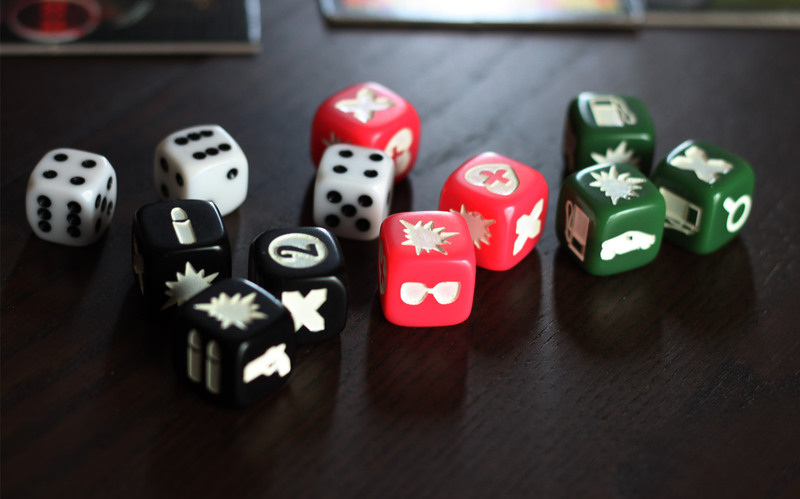 Most of the dice included in the game are custom dice with unique icons. These icons match up with icons on player boards; when searches are made, icons rolled increase those specific resources. In combat, players get a base set of dice and can use ammunition to increase the dice pool, not to mention upgrading their gun for permanent bonus dice. In Combat, Blast icons must be rolled to hit criminals. A special “X” icon can be used to double the value of another icon when rolled. 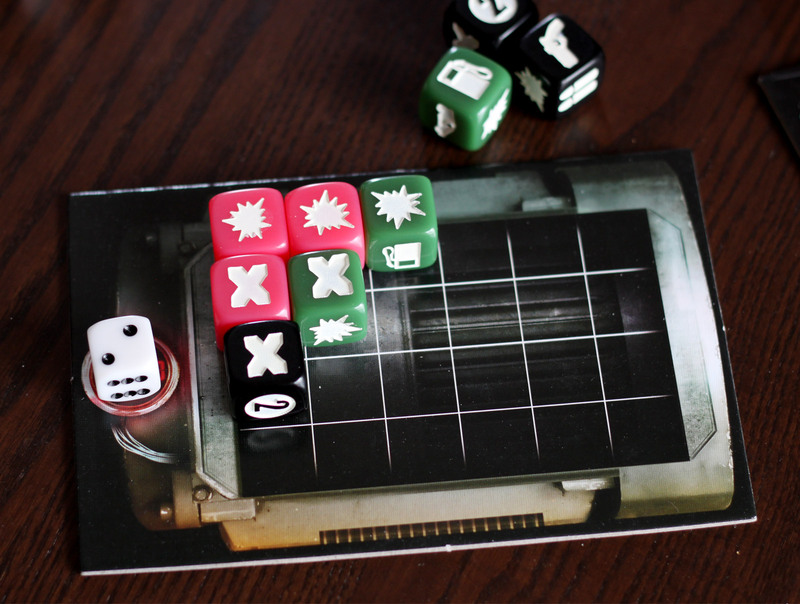 Disarming a bomb involves a little mini-game that is somewhat akin to playing tic-tac-toe with yourself – you have to roll all the dice and place all blasts and X’s on the bomb grid. Your goal is to get 3 X’s in a row (you get to re-roll the non-X or Blast dice), but each time you start a new column, the timer ticks down by 1. Agents are at risk from damage from random street thugs while cruising or searching, bombs exploding, assassins, and in some cases failing to subdue a criminal. If an Agent drops to 0 Stamina, they are sent to the hospital while losing 1 point and any criminals in their custody. A point is scored for subduing a criminal, killing an assassin, or disarming a bomb. Also, upgrading one category of equipment will score you a point, as well as turning in 6 points of Evidence at headquarters. After 6 rounds, players calculate additional points; 1 for each informant still alive on the board, and bonus points for criminal cards they’ve collected. But wait, there’s more. An optional “android mode” can be played with 3 or 4 players, in which players are assigned 3 random identity tokens at the start of the game. 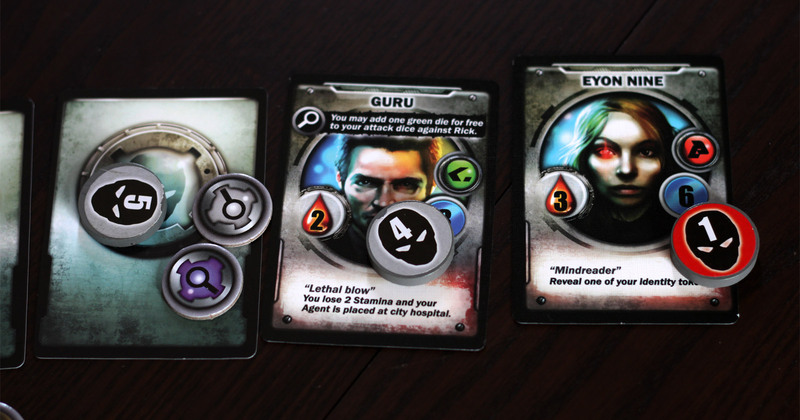 These tokens are kept hidden from other players until in-game effects force them to reveal one token. If a player ever has 2 Android identity tokens facing up, they become an Android player. Android players have a slightly different objective. They no longer attack criminals or disarm bombs. Instead, they can attack other Agents. On top of that, they can attempt to attack and destroy locations on the board. Androids score a point for every destroyed location and every time they send an agent to the hospital. Agents also have the option of attacking Androids and scoring a point every time they send one of those to the hospital. Rogue Agent is an interesting beast; it’s got a great premise and is a genuinely enjoyable game. Unfortunately, it is kept from being great thanks to a somewhat convoluted system of rules that is overburdened with luck and arbitrary restrictions. Now, the backstory for Rogue Agent is definitely confusing, and this compounded by the backstory on the website being different than the story in the rulebook (and the online version makes much more sense). In the rulebook, the Agency is mysterious and sinister and is working with the corrupt government to fight crime, at least until the government got… jealous? At how efficient the Agency was doing. Anyways in the game the police aren’t exactly working with you – they prevent you from attacking criminals or really doing anything useful wherever they are. But I’m not sure why these two groups are at odds. Maybe they’re not? At some point the Androids get their code corrupted, or something. I dunno. Online, the story is a bit different – the corrupt government is letting things get out of hand, so this mysterious Agency forms as an underground organization to fight crime and take the city back. This story makes much more sense from all angles – not the least of which is why the game is called “Rogue Agent.” I’m not sure why these two stories are inconsistent. Anyways, the backdrop of the game in either case is the same; there’s a lot of crime, you’re there to fight it, and you’re not too friendly with the police. And you’re not exactly held to restrictions of police regulations or protocol, which means you can just go out there and start beating up and taking down criminals through any means necessary. Well, that’s exciting at least. The bomb is ticking down, but there’s still time! There’s a lot of cool stuff going on in the game. Perhaps too much. The long rulebook is a little chaotic, and much less streamlined than it could be, which adds to the complexity, at least for learning the game. But you can cruise around the city, search locations by rolling dice (which is pretty fun. I mean, c’mon, fistfuls of dice… always fun). You have to fend off a bunch of thugs as you run around the city, and every search puts you at risk of being attacked. You can pursue criminals but success can be difficult and the effects of failure can be pretty drastic. Oh, and you’ll need to watch out for assassins and bombs, which are very bad for your health. The Bomb-disarming minigame is pretty well implemented. 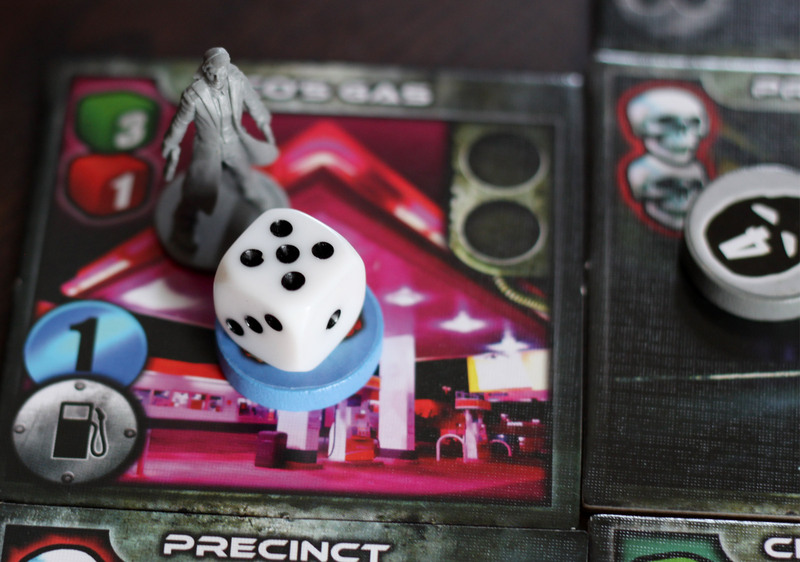 It’s exciting and tense, and it is the best use of dice in the game. You try to get 3 X’s in a row, but you must place all Blasts and X’s on the grid. You get to keep re-rolling dice that aren’t X’s and Blasts, and all the while the timer is counting down. It’s pretty darn fun and has the potential for some exciting moments – in one game, a player decided to attempt disarming a bomb that was already at “1” on its timer, a near impossible feat. At 1, it’s time to run. Instead, this guy rolled 2 X’s and a Blast, and in his next roll he rolled a single X – exactly what he needed to disarm the bomb without it exploding. Ridiculous. Awesome. There’s no doubt, it’s an exciting and deadly world. Things will blow to pieces in front of your face, your trusted informants will help you and then mysteriously disappear (ok, not mysteriously, the assassin got to them). I hope you don’t expect to round up criminals by the dozen. You’ll be lucky if you don’t end up in the hospital (fortunately, the hospital – not the graveyard – is where you end up when you lose all your health). You won’t score a lot of points, but neither will the other players, and the race is tight. Player boards track everything. Hey look, an Android! And oh boy, when you play Android mode, watch out. Since the game isn’t cooperative, there’s not a lot of tension in the reveal itself – the Android player(s) simply change from one type of opponent to another. But an active Android takes destruction to a whole new level – Not only do Androids score points for attacking Agents and sending them to the hospital, they can literally target locations on the board and destroy them, turning them into a pile of burning flame that damages criminals and agents alike. This certainly is a city overrun with chaos and on the verge of collapse. Watch out. Unfortunately, there is a strange dichotomy in the rules that prevents the game from being truly great. The design draws from 2 different styles of gameplay. I don’t know if there are technical terms for these, but one is the Agricola school of thought – that is, you don’t have nearly enough actions to do everything you want. 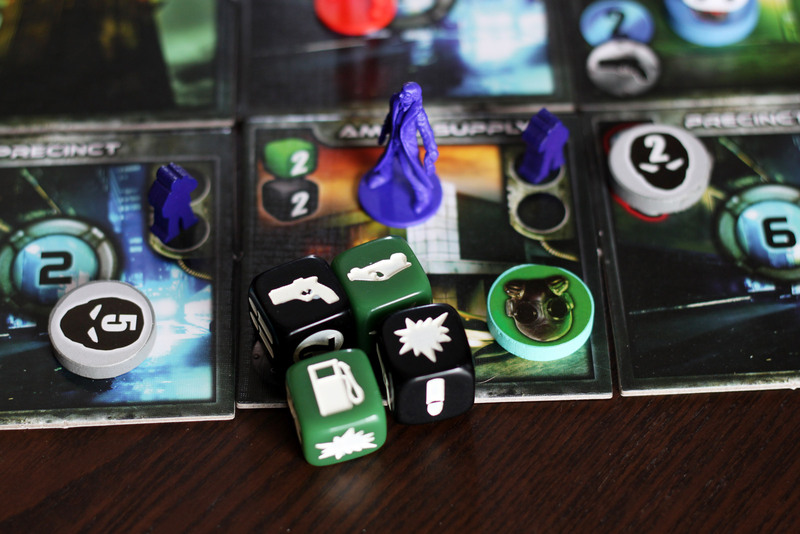 The other is that of King of Tokyo – the excitement and tension of dice rolls, of risk and potential for failure. It doesn’t sound bad on paper, but at least in Rogue Agent these two styles do not mesh well. Both approaches could work well for this game – with only 12 actions over the course of an entire game, you really do have to choose when to search and when to fight a criminal, when to spend resources and when to save them. There’s a tension inherent in those forced decisions. The tension is deflated, though, due to the frustration of luck. It doesn’t matter how much effort you put into preparation – getting upgrades and resources – whether or not you take down that Strength 4 criminal depends entirely on a single dice roll. There’s no way to ensure success or even partial success. There’s no way to push your luck in combat, risking your Stamina or other negative effects in order to press into combat and take out that big ol’ criminal. You just roll, and if you fail (which is extremely likely, by the way), you’ve just wasted a significant chunk of your action pool, not to mention valuable resources like ammunition and stamina that you’ll have to spend actions to rejuvenate. Adding insult to injury, the riskiest things don’t reward you all that much. A strength 4 criminal is worth 1 point just like a strength 1 criminal. The only difference is in the cash reward when you turn them in (incidentally, it takes 3 of your 12 actions to subdue, arrest, and turn in a single criminal). But cash is needed to really upgrade your equipment (you can depend on luck in searching, but you’ll probably end up spending more actions to boost your upgrades that way), which you really need to do to realistically have a chance at those strength 4 criminals. There are strange restrictions and limitations on luck throughout many of the game’s actions, and it seems so strange to me. It seems like some of these things lend naturally to slightly modified mechanisms that would make the game more fun, immersive, and even thematic. Why does buying commodities (upgrades and resources like ammunition, fuel, etc.) have to be a Justice action when it’s already limited by how much cash you have? Why are there so many slots before an upgrade is activated (and why are the upgrades so weak for the effort it takes to unlock them)? Why can Informants only be placed at the end of your turn when they too are limited by cash, when it would be much more strategic to allow Informants to be bought at any point? Then players would be able to decide when to spend extra fuel to get to a location they need an informant, and would have to carefully choose the placement since informants are so vulnerable anyways. For that matter, why prevent players from Cruising after their second Justice action? There are already inherent restrictions in the resources players have available to them, and these extra restrictions limit decision-making in the game (and not in a good way) on top of complicating the rulebook. I’m not sure why many of these things are the way they are. Perhaps many players disagree with me and prefer the limitations. I for one thing that if you’re going to have to have a heavy luck element, you either need to have enough time in the game for luck to even out, or have some specific ways to mitigate or circumvent luck. (For example, why not make the gun upgrade get you guaranteed hits on a criminal in addition to your dice, rather than just more dice to roll?). In Rogue Agent there are just too few actions to depend on heavy luck, and heavy amounts of luck are required to get the biggest criminals. 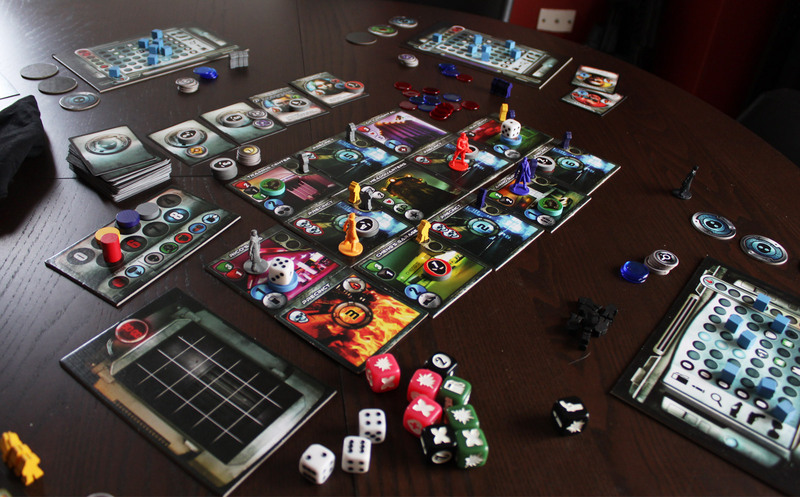 The components of the game are a mix of good and average. The art is great and evokes a dark, cyberpunk feel appropriate to the theme. You’ve got plastic minis for the Agents and the Police (although many people think the Police are a player character at first glance because of this). 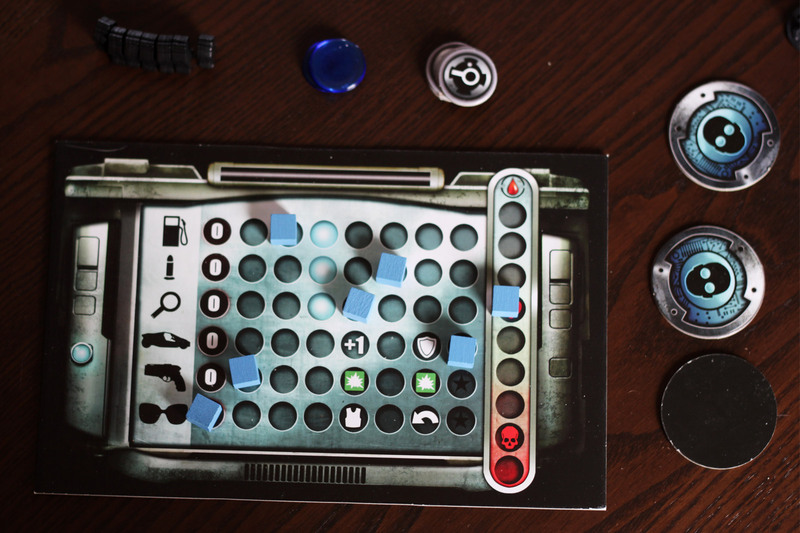 The player resource boards have circular slots while the markers are cubes, which is only a minor annoyance – otherwise the boards work well. The cardstock for Criminals is decent and the design and layout is easy to read (on both the cards and location tiles), the cash are translucent tokens which give a cool futuristic feel. For some reason, though, my location tiles were not perfectly square, so when assembling the board they didn’t quite fit flush together. I don’t know if that was on purpose, maybe to make it easier to flip locations when they get destroyed, but it is what it is. The rulebook could use some work – it feels fairly unorganized, certain sets of rules were repeated in detail too often, and there is a lot of text. Fortunately there are a lot of diagrams and some good examples in the back, so you should be able to figure it all out. What’s sorely lacking are player aides, and with so many actions available it is ridiculous that they aren’t included. You can grab some to print off of Boardgamegeek, but they should be in the box. 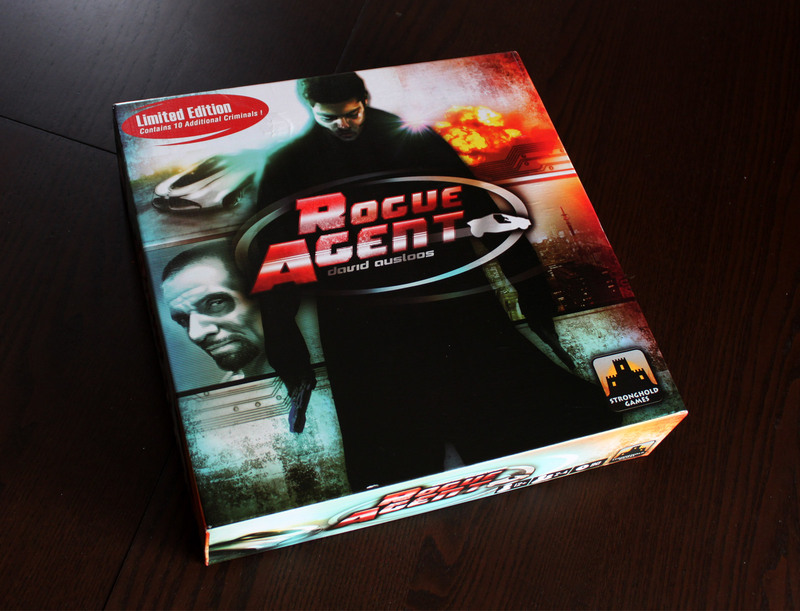 Rogue Agent is definitely for the theme-loving players among us. You’ll get the most enjoyment if you imagine the fights between agents and criminals, if you sweat the countdown timers on bombs, and you watch Androids marauding through the city wreaking destruction. There’s plenty of action going on. It’s just too bad that it’s also very close to tense, exciting, and strategic gameplay and just falls a little bit short. The bomb disarming mini-game is actually pretty cool, and very thematic feeling. I will probably keep playing Rogue Agent. I may try to implement some house rules to see if my ideas actually make it more fun, because I want to love this game. As it is, I mostly enjoy it, and mostly for the thematic elements. The gameplay doesn’t ruin the theme, it just feels like it didn’t live up to its highest potential. It’s fun to roll dice, to seek out criminals and assassins, and it’s exciting to try disarming bombs. If the theme appeals to you, definitely give this game a try. If not, I doubt the gameplay will win you over. 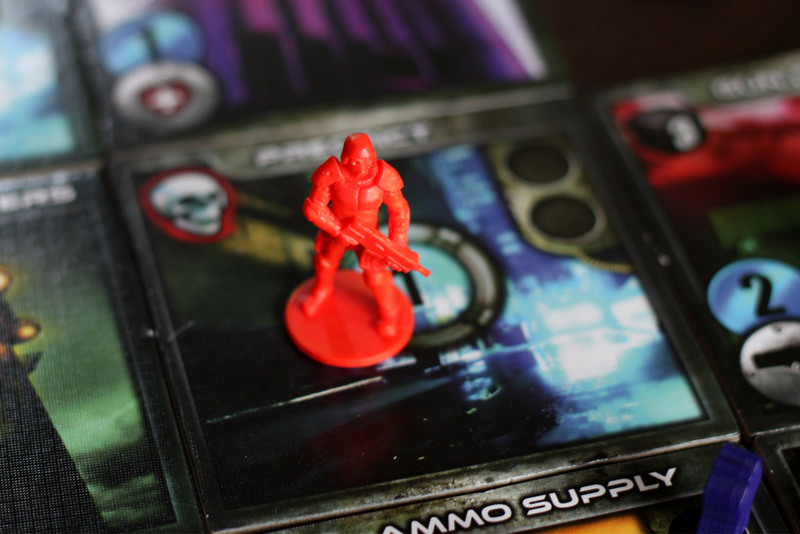 iSlaytheDragon would like to thank Stronghold Games for providing us with a review copy of Rogue Agent.